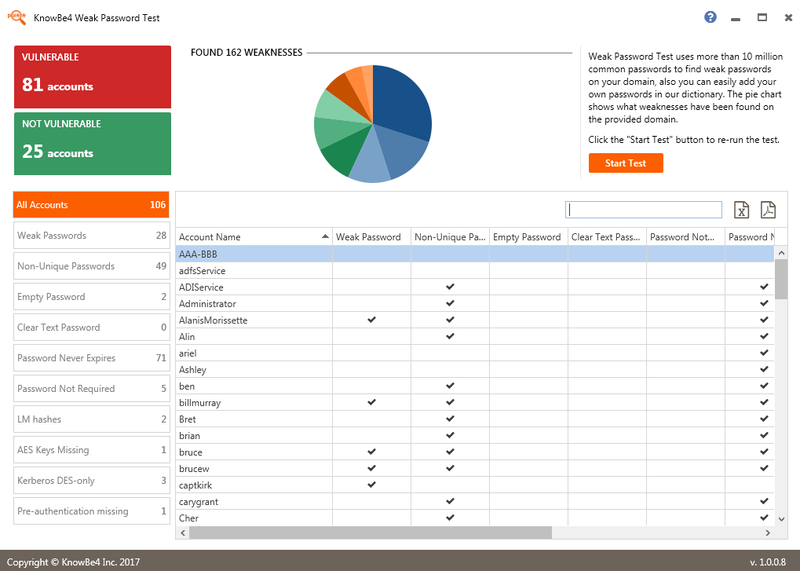 On the heels of Verizon’s 2017 Data Breach Investigations Report, IT security company KnowBe4 released Weak Password Test (WPT), a free tool for organizations that use Active Directory. As the fastest growing security awareness training and simulated phishing company, KnowBe4 found this was an area where companies needed help. The Verizon report, which KnowBe4 participated in, showed 81 percent of hacking-related data breaches leveraged either stolen and/or weak passwords. To keep security tight, the tool does not show/report on the actual passwords of accounts, it simply reports on the accounts that are affected by the aforementioned vulnerabilities. Number 139 on the 2016 Inc 500 list, #50 on 2016 Deloitte’s Technology Fast 500 and #38 in Cybersecurity Ventures Cybersecurity 500. KnowBe4 is based in Tampa Bay, Florida. For more information, visit www.knowbe4.com and follow Stu on Twitter at @StuAllard.